All Official’s comments are now posted below. Great Map – produced by Peter Leverington. Great Courses – produced by Peter Leverington and Steve Nobbs, controlled by Bruce Marshall. Fantastic Volunteers who so willingly volunteered their time – you made my job very easy. It was lovely to see so many of you turn out for the EAOA Championships. Well done to all the class winners. A big thank you to the SI team who produced the results ready for the trophy presentations, it was great to see so many people at the prize giving. Thank you Paul and Barbara Beckett for sorting this, along with Clive Wilkinson who presented the Joan George Junior Trophy to Willian Bartram from NOR. The Eastern region of the National Trust have a long established working arrangement with the NOR club. Along with other private landowners there were no restriction areas apart from an OOB area to avoid a live badger set. As the event mapper I was happy when invited to act as a planner as long as I was assisted. This worked well working with Steve Nobbs by dividing the courses between us, with ongoing adjustments to avoid clashes between courses and the need not to have too many controls. Our controller Bruce Marshall was fully involved and very supportive in the course planning team and was always ready to offer advice. Over the weekend Bruce and Maria worked tirelessly visiting every control site to check all were correctly positioned and in place by the time the event started. By no means an easy task visiting 56 controls with plenty of climb. Alan Bedder took on the initial task of agreeing access with the Trust for the event and Karen and Paul coped magnificently in the lead up and on the day event organisation. It is a pleasure to plan at Sheringham Park, as there are so many options. It is a fabulous area, and I hope that everyone enjoyed our courses. We even ordered the sunshine (we did talk about what to do if it snowed!!). We kept the courses down in length to take in account of the climb, not many locations in Norfolk that you can do that, and I am sure many people appreciated that. Also nice to see that many people stayed behind for the EA Champs prize giving. There were lots of cups to give out to many participants – well done to all the winners. I also saw many people having picnics on the grass in our spring-like weather, and many more took advantage of the tea rooms. All in all a nice day was had by many, including me. Thanks go to Peter, my co-planner, who did the re-mapping and most of the work, and to Bruce, our controller for keeping us on our toes. Also thanks to Karen and Paul for their slick organisation, and to all the volunteers for their help to run the event. I think you will agree that Peter and Steve devised some excellent courses for you. Looking at Routegadget I see that even the top placed runners found it difficult to hit every control cleanly. Special thanks to Peter for the map. He spent many long days away from home to update the map. Quite challenging when the vegetation is being actively managed every day. 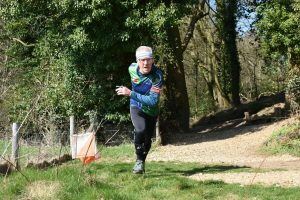 This is one of East Anglia’s top areas so it’s a pity that more orienteers didn’t make the effort to come to Sheringham and take advantage of this excellent terrain.